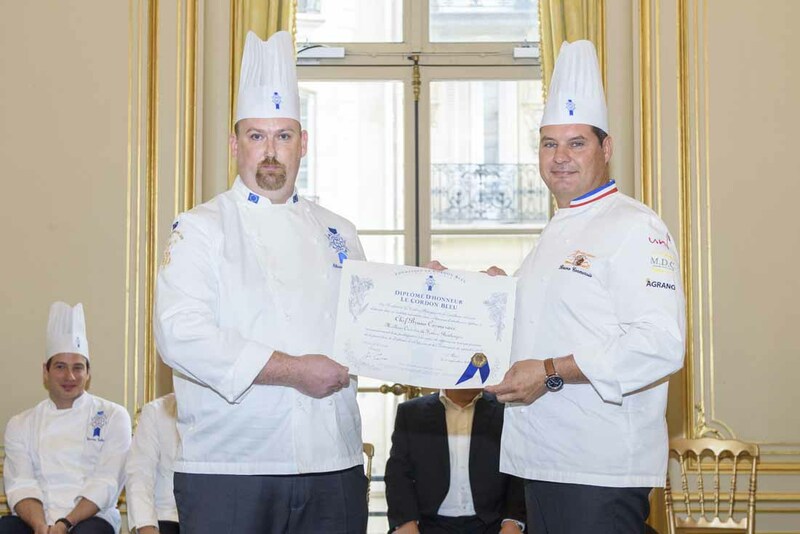 The graduation ceremony for Culinary Arts students (Grand Diplôme – Cuisine Diploma – Pastry Diploma – Boulangerie Diploma) took place on 1st September 2017.Bruno Cormerais, One of the Best Craftsmen in France (Meilleur Ouvrier de France - MOF) boulangerie, jury member for the Bakery World Cup and television presenter on the M6 television programme, La Meilleure Boulangerie de France (Best Boulangerie in France), were class patrons for this new class of graduates. On Friday 1st September 2017, the families and friends of the soon to be graduates gathered at the Cercle de l’Union Interalliée as Cuisine, Pastry and Boulangerie students were awarded their diplomas. This was the crowning point of months of studying alongside Le Cordon Bleu Paris Chef Instructors. Chef Bruno Cormerais, One of the Best Craftsmen in France (Meilleur Ouvrier de France - MOF) Boulangerie, jury member for the Bakery World Cup and presenter of La Meilleure Boulangerie de France (Best Boulangerie in France) television programme on M6, was class patron for the pastry and boulangerie graduates. The Chef Instructors also wished the students all the best as they set out on their careers. We would like to welcome all our graduates to Le Cordon Bleu extended alumni family around the globe. Who is chef Bruno Cormerais? Born in Bussy St. Martin, Bruno Cormerais took his first steps in boulangerie at Gouvernes where he successfully completed his “Certificat d’Aptitude Professionnelle (CAP)” in Boulangerie and then in Pastry. He continued his path with Monsieur Pélissier at Montevrain, then with Monsieur Thierry at Villeneuve le Comte. At the age of 25, he was awarded his “Brevet de Maîtrise” in Boulangerie and went on to enter numerous regional competitions. He then joined the team at the Moulins de Verneuil where he was in charge of quality control and follow-up. This role gave him the desire to share and teach his knowledge and experience to artisan bakers who were keen to perfect their skills. In 2000, he worked as a Bakery advisor for the AMO group, where he gave advanced training workshops on specific themes. Since June 2007, Bruno Cormerais has worked as an Artisan Baker in the city of Bussy St. Georges. Chef Cormerais holds the prestigious title of One of the Best Craftsmen in France (Meilleur Ouvrier de France - MOF) Boulangerie. He has also won several accolades including: Gold Medal at the Arpajon Fair, Silver Medal at Romarantin and the Paris Baguette Silver Medal. Bruno Cormerais is a founding member of the Ambassadeurs du Pain (Bread Ambassadors) and a member of the French Boulangerie team. He sits on the jury of renowned competitions such as the Bakery World Cup. For the past 5 years, he has hosted La Meilleure Boulangerie de France (Best Boulangerie in France) television programme on M6.